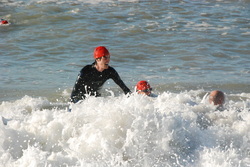 Jon marshalling from under the waves! Well done to all who took part on Sunday. A challenging entry & exit to the swim phase with a hefty sea swell saw several competitors (& marshalls) swept off their feet. All in all though the weather behaved itself and conditions were good for racing and spectators alike. Susie Casebourne clocked a superb time of 8:04:55 on the swim leg of the Jamie Hanney team entry.